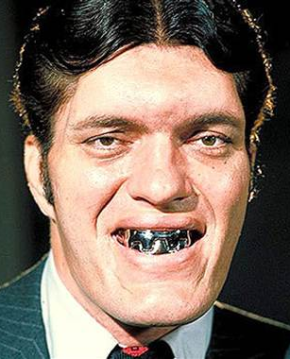 Just wanted to pay a quick tribute to the awesome Richard Kiel who was probably best known for playing the giant metal mouth henchmen Jaws in both The Spy Who Loved Me and Moonraker and in some of the more recent Bond video games. He also played Kanamit in The Twilight Zone episode "To Serve Man," Mr. Larson in Happy Gillmore, and dozens of other roles in both television and film. Mr. Kiel passed away yesterday. Mr. Kiel: You were by far one of the most iconic Bond villains ever and will never be forgotten so long as spy movies exist! For Bond fans keeping count, actor Gottfried John who played General Arkady Grigorovich Ourumov in GoldenEye also passed away earlier this month. This is just really odd because this past month or so I've been on such a Bond kick again. I even have pulled out my Nintendo 64 and have been playing GoldenEye on it. So long Jaws you will be missed.